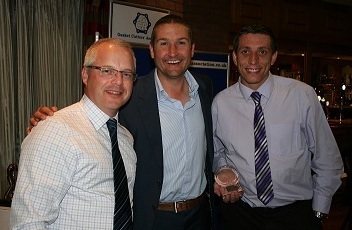 Team MacLellan Rubber had a winning round at the 2011 Gasket Cutters association (GCA) Golf day held this year on the 14th of July at the Abbey Hotel Golf and Country Club in Redditch. In total 25 people teed off from 19 GCA member companies on what turned out to be a surprisingly sunny July day. Organised by Simon Carless on behalf of the GCA Committee this was a great day with plenty of challenges, surprises and a great deal of humour as witnessed by Dean Barrett (still with JP) being the only wearer of the MacLellan Rubber golf caps. Congratulations must go to our own Simon Winfield for winning the nearest the pin competition and also for his team efforts with Simon Winfield (yes there are two of them) and Scot Mackay (SJG) in winning the MacLellan Rubber Sponsored team competition (pictured). Further congratulations must go to Mark Ambrose of Garlock (UK) Limited for winning nearest the line, and also to Keith Shepherd of J.A. Harrison for winning the individual Stableford competition. On the day MacLellan provided commemorative printed golf balls, towels, caps and golf umbrellas to those taking part in the days activities, to keep as a memento of a congenial event and to celebrate the 140th anniversary of MacLellan Rubber. The evening awards dinner was well attended as guests swelled the numbers. Simon Carless as master of ceremonies entertained the assembled throng who enjoyed good food, good wine and one or two pints. The evenings festivities by all accounts continued into the early hours of Friday morning! Simon, Andrew and the team look forward to seeing you at the 2012 event.